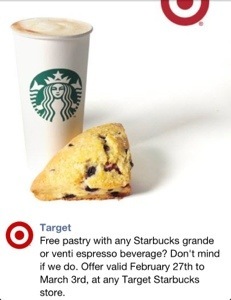 Free pastry at Target Starbucks | ...and another cup of coffee. There is a new deal for a free pastry with the purchase of a grande or venti espresso drink at Starbucks inside Target stores! This deal is only good from February 27th through March 3rd.